云南快乐十分前三组 www.h69au.cn As an aspiring soil conservationist, Luther Thompson II is eager to dig into future career opportunities. Thompson is a rising senior at Alcorn State University, a historically black land-grant university in Lorman, Mississippi. This is his fourth summer as an intern with the USDA Natural Resources Conservation Service (NRCS). NRCS helps America’s farmers, ranchers, and forest landowners conserve the nation’s soil, water, air and other natural resources. Thompson’s passion for agriculture took root at home in Jackson, Mississippi. This summer, Thompson will intern at a USDA service center in Alliance, Nebraska, where he will check windbreaks, construct grazing plans, and assess Conservation Reserve Program (CRP) grasslands. 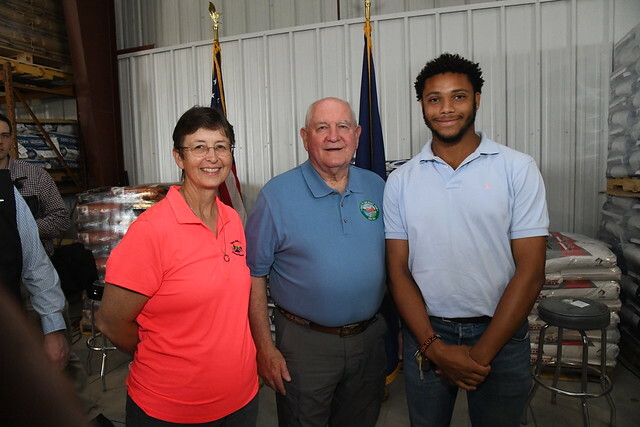 He will contribute to one of 2,000 USDA service centers nationwide that connect customers with resources from Farm Service Agency, Natural Resources Conservation Service, and Rural Development. “It surprised me that the NRCS has field offices all over the nation. I did not know that. There is one even close to where I live back home in Jackson,” remarked Thompson. During past NRCS internships, Thompson worked as a rangeland specialist in the NRCS Imperial, Nebraska office, and as a soil conservationist intern in McCook, Nebraska and Beaver City, Nebraska. An Agriculture Business Management major, Thompson hopes to work as a soil conservationist after he graduates. He encourages other college students to pursue Pathways internships at USDA. Thompson’s USDA internships were arranged through the Pathways program, which offers federal internship and employment opportunities for current students, recent graduates, recent veterans, and those with advanced degrees. Pathways opportunities help students and recent graduates excel in their chosen fields, such as agricultural, science, technology, mathematic, environmental, management, business and many more. Learn more about Pathways opportunities at USDA by visiting www.usajobs.gov/studentsandgrads. I noticed in the article that this young pathways student is a Ag Business major. I doubt that he will qualify to be converted to a series 457 Soil Conservationist due to the lack of very specific required college classes such as soil science and plant sciences. This young man deserves to be informed of these requirements ASAP.